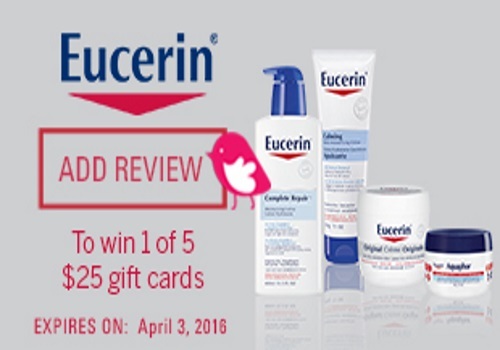 Chickadvisor has just launched a Eucerin Review Challenge! If you've ever used Eucerin products they are inviting you to participate in a special review challenge for a chancce to win 1 of 5 $25 gift cards. To take part, just write reviews on Eucerin products you are currently using or have used in the past at the link below. For every Eucerin product you review, you will receive bonus ChickAdvisor points and be entered for a chance to win one of five Chapters/Indigo e-gift cards valued at $25. If you review five Eucerin products, you'll also automatically receive a limited edition profile badge! Contest closes April 3, 2016.